Bikini Party is set, on the sand. In a fast paced game of beach volleyball. The reels are strung up between bamboo, and act as a net, for the beautiful woman playing volleyball. This theme is as much about the girls as it is the sport. They are skimpily cladded in swimsuits, and Bikini Party, find them in all kinds of compromising positions. Bikini Party was developed by Microgaming. They are a big name and have been making games for as long as there have been game to make. Microgaming is based in the United States, and manufactures roughly half of all land-based slot machines. They brought out an online casino in 1996, which by their reckoning was the first. They have released over 600 games. Bikini party is a five reel slot. It is set on the beach. Two bamboo poles border the reels, which are the poles of the beach volleyball game. It is a well designed game. All the bright colours, give this slot a cheerful feel to it. This slot is as much about the beautiful woman, as it is about the sport. Microgaming called this slot Bikini Party for a reason. They have animated the girls to wobble and giggle, when the player makes paylines. There is an intro sequence in the beginning of the game, which puts the girls in compromising positions. Microgaming has settled on a black panel. This is a stock standard Microgaming panel, which they have used in many of their games. It was a poor design choice. Everything else on the slot is happy, go lucky, and Microgaming have decided to use a black panel. It is found under the reels, and houses all the game’s controls. At the bottom of each reel is a respin button. This is a base game feature, which the Special Features section will cover. There are 243 paylines in Bikini Party. This number represents the amount of paylines required, to have a matching symbol count towards a win anywhere of the adjacent reel. The base game has standard gameplay. The spin button spins the reels, and the player places a bet using the bet controls in the panel. All 243 paylines are played left to right, which means that the first symbol in a winning line must be in the first reel. If the player would like to know more about, paylines, bets, or symbol values, all of this information is stored, in the plays tab on the right of the screen. In Bikini Party, the player can respin a single reel, once all the reels have come to a stop. There is a variable cost to do so, calculated using the odds of the player winning. It will be expensive to respin the reels if the player could win big by doing so. This is a great feature, which requires a bet to play. It can be a lucrative feature. Used strategically, with a healthy dose of luck, to win big. It gives the player another chance to make that big win and although it can be costly, this is the nature of gambling. The free spins feature, is triggered by landing three of more scatter symbols anywhere on the reels. The scatter is the volleyball symbol. After a great in reel animation, the background changes, turning the sky orange. The reels spin 15 times. This feature is made better with the addition of a three times multiplier. The spins are played at the bet, which triggered the game. The player does not have the option to respin reels. 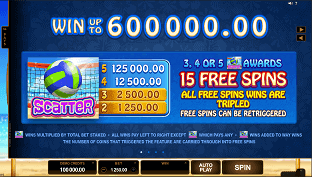 The biggest wins are only possible in the free spins mode, because of the 3x multiplier. Bikini Party delivers the massive jackpot that. Microgaming is known for. The largest five of a kind win carries 200,000 credits. Bikini Party is a great game developed by Microgaming. It is a nice looking slot with great gameplay. The reel respin adds an element of strategy to the reels, which players will enjoy. There is big winning potential. And a free spins game mode, with a multiplier. This game does a lot right.